The instruments shown here are a subset of the aneroid barometers shown on the Aneroid Barometers page. All are suitable for marine and boating use and are in stock and available. 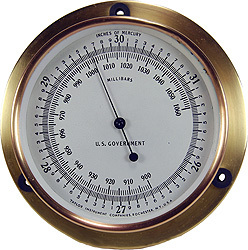 Marine barometers that are used on board should be fastened to a bulkhead for safety's sake. 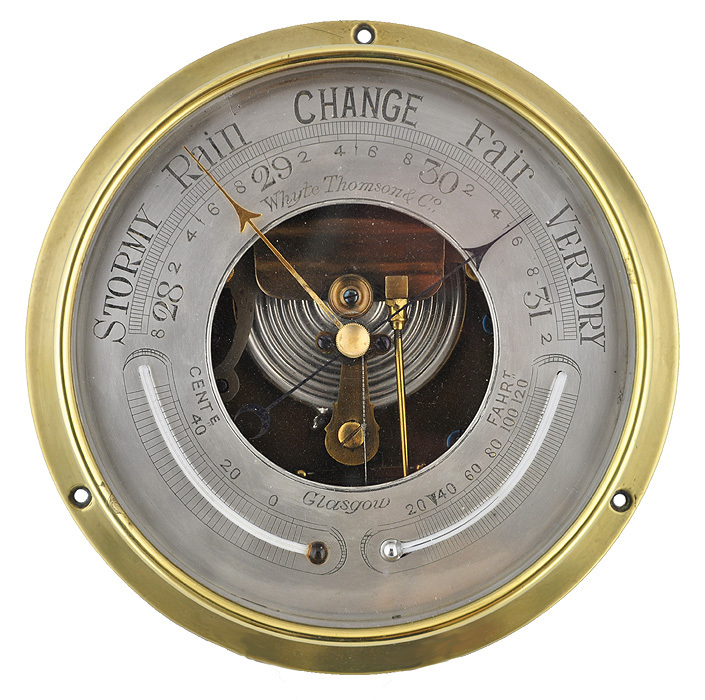 Often the flange on the back of these barometers is used to secure them. 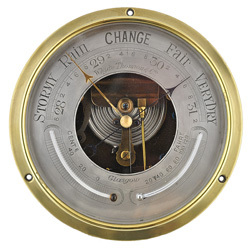 Any of the barometers shown on this page can be used on sailboats or motor yachts. Sizes given are for the diameter of the body; another inch or so should be added to include the flange. Call for prices and additional information. 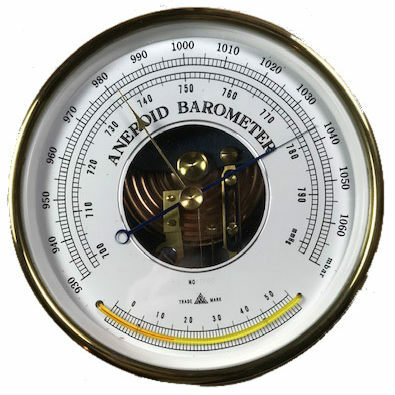 Aneroid barometers can be shipped by post or UPS to any destination. 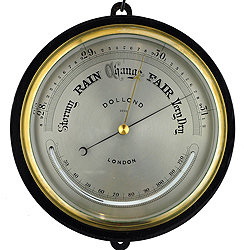 Fine marine barometer. 6 inch diameter, flanged back, calibrated in millibars. $325 plus shipping. A super marine barometer for a larger yacht. Marked Whyte Thomson, Glasgow. Twin curved thermometers, 6-1/2 inch diameter. $575 plus shipping. 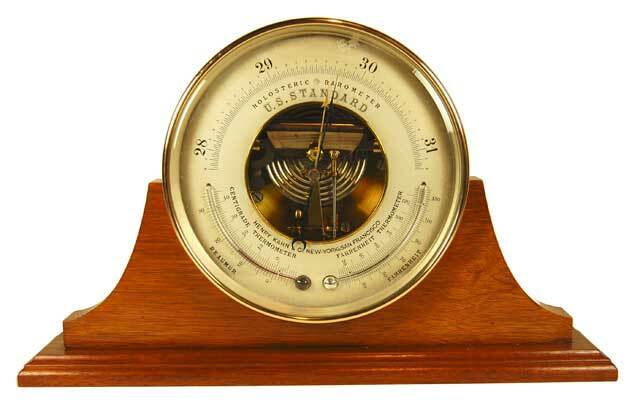 A fine aneroid barometer marked U S Government made by Taylor, Rochester NY. 5-1/4 inch dia. Price $375 plus shipping. 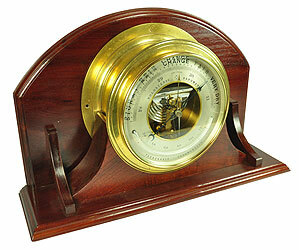 A large handsome marine barometer, 9-1/2 inch diameter with a big curved thermometer. Price $675.00 plus shipping. 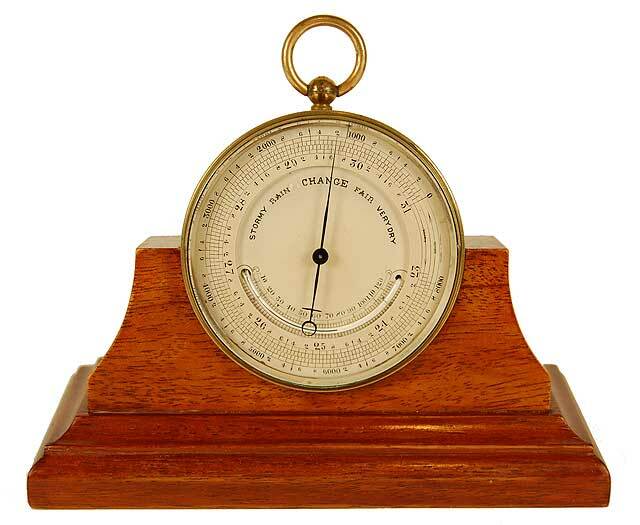 MANY OTHER FINE BAROMETERS ARE AVAILABLE! We make stands to order to hold barometers of any size and shape. Shown are mahogany, but we can supply any wood of your choice. Stands are $85 to $200, depending on complexity.